If you are looking for information on the YoNaturals franchise business opportunity, YoNatural franchises or YoNaturals franchising , then you have come to the right place. In turbulent times like the present, promising alternative investments actually do exist and look even more appealing than ever before. These unique investment opportunities exist because they have no connection to volatile stock market fluctuations, plummeting real estate or high oil and gas prices. One such investment category that continues to grow is YoNaturals Healthy Vending! Because our approach to securing the best locations for our customers (schools, colleges, white collar businesses) combined with our huge range of natural and organic products (available online with nationwide free delivery) and the best customer service gives you as the investor the best chance at obtaining the highest possible return on investment. It's that simple! "Becoming a distributor for YoNaturals was one of the best decisions I ever made. The process for getting started went very smoothly and the post launch support has been great. They secured me some great locations, some of which average a lot more vends than I could have anticipated. What's really great is that you don't necessarily have to have previous vending experience to be successful. After extensive research, I concluded this was the best opportunity out there for me or anyone contemplating a career change and becoming their own boss." 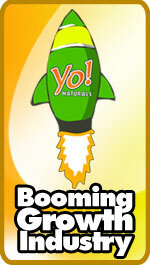 YoNaturals was launched early in 2006 with the introduction of the YoZone (snack / beverage) vending machines offering 100% natural and organic products. Our healthy vending machines offer high profile product "best sellers" recognized to the consumer and found within major healthy retailers such as Whole Foods Market, Wild Oats and Trader Joes. We also offer specialized location "planogram" menus for schools, hospitals, corporate offices, health clubs and many other types of traditional vending locations to ensure all our customers are selling the most appropriate products at all times. Our YoZone healthy vending machines feature optional state of the art proprietary software for 24/7 monitoring and cashless payment systems for debit and credit cards. The YoZones machines feature specially designed graphics to set them apart from traditional vending machines so consumers can identify them as healthy. Operate a minimum of five (5) YoZone machines placed on your behalf in a wide variety of great locations secured by our company. 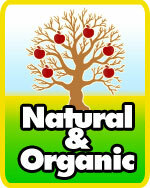 YoNaturals will deliver and install your machines to the locations secured for you. Training is provided on site in your area and prior to your machines being delivered. On going product support, technical service and marketing support will be provided by YoNaturals - we pride ourselves on customer satisfaction and support. SPECIAL OFFER - ORDER 10 MACHINES BETWEEN NOW AND Nov. 30th (2008), AND YONATURALS WILL ALSO INCLUDE $3000 IN FREE PRODUCTS TO GET YOU STARTED ALONG WITH YOUR OWN PROTECTED TERRITORY. 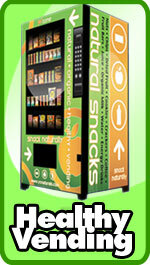 We recently began our new healthy vending business and have begun placing machines. We have placed 8 machines and all have met or far exceeded our expectations. Our most successful machine was placed last Friday. It is located at a private school near our house. We finished filling it at around 11:30 on Friday, and had to restock the machine later that day! On Monday and Tuesday we also sold way beyond our expectations. Wednesday morning we filled the machine at 7:30 am and went back at 11 am and we already had to restock some coils ... tomorrow we'll see if we set another record! One month from placing our first machine we are averaging more than we thought we could at our locations. We are receiving very positive feedback from the locations and are happy with our decision to start our healthy vending business."